The last car drove out of the Albion Motor Car Company in 1915, the company thereafter concentrating on the manufacture of commercial vehicles. 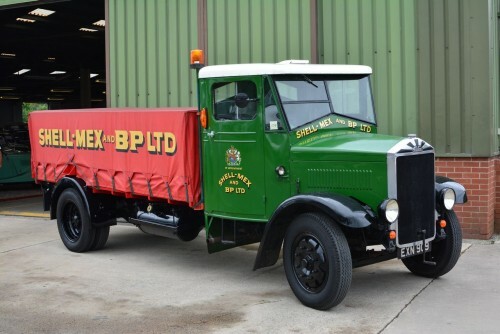 It wasn’t until 1930 that the company changed its name to simply Albion Motors and in September 1935 they introduced their highly successful 126/7 range of trucks which offered a particularly high payload for a lorry of under 50 cwt unladen weight. This ratio was further improved in the new K range, as offered here, which was uprated to five tons GVW, selling particularly well in overseas markets which had restrictions on individual axle loadings. The 65bhp petrol engine was a robust and unstressed unit, these tough commercials living up to the company moto ‘Sure as sunrise’. Available in forward control layout as the KL127 or the bonneted KL126, they were soon joined by an otherwise identical six-wheeler which eventually became the mainstay of production. This superb KL126 was sold new to Shell-Mex and BP in 1938 and fitted out as a petrol delivery lorry. The rear tray was designed to house boxes of six cans, the vendor confirming that he has amassed a large collection of cans which are available by separate negotiation should the new owner wish to display it as it would have looked originally. It remained in service until the late ‘50s, the vendor acquiring it in 2006 to join his considerable collection of commercial vehicles. Restored some time ago, it has been beautifully sign-written in its original livery and remains in first class show condition. Of moderate proportions, we are advised that this fine specimen has a respectable turn of speed on the open road and ticked over like the proverbial Swiss watch when we were taking the photographs. Always popular whereever she goes, this beautiful bonneted Albion looks terrific value at the suggested guide price.